Whenever you think of a wrap dress, you think DVF. 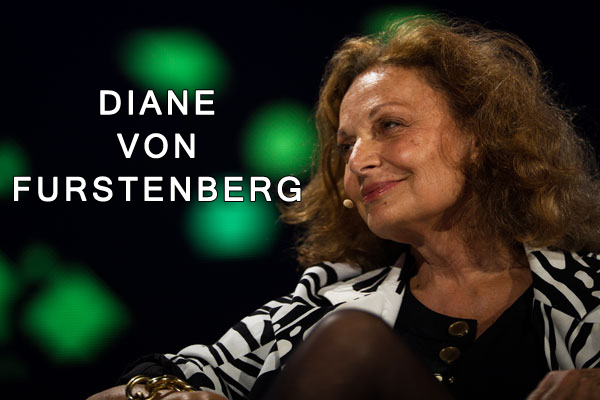 Diane Von Furstenberg, an icon and a super woman who apart from being a business mogul, is a philanthropist who is passionate about inspiring and being inspired by women. Oprah describes meeting DVF as being just for a moment, in the center of the universe. We can only just imagine. Having read and watched a lot of DVF’s interviews and writings, i felt i would be doing you lovely, beautiful, amazing women a disservice if i didn’t share with you, some insightful words from DVF which revolves around life, career and women. Your wrinkles reflect the roads you have taken; they form the map of your life. My face reflects the wind and sun and rain and dust from the trips I’ve taken. My face carries all my memories. Why should I erase them? Fear is not an option. It just isn’t. You’ve got to deal with whatever. The most important relationship you have is with yourself and then any other relationship is a plus, not a minus. Get to know yourself. And don’t waste your time! Be hard on yourself. You have to be non-delusional in order to like yourself but if you are straight to yourself, you will also be nice to yourself. My mission in life is to empower women. I do it through my work, i do it through mentoring and i do it through philanthropy. Life is a journey, people come in and go out, landscape changes and some things are good and somethings are not good but its your life and you’ve just got to embrace it and live it. Being true to who you sell, your brand. Nothing gives you more courage but the truth. Women never cease to impress and inspire me, and I am very happy to create the DVF Awards to honour and reward their leadership and dedication to the advancement of women. Gotta love Diane Von Fursternberg!